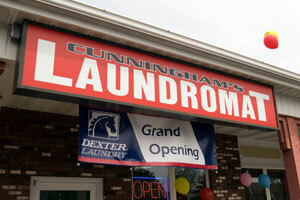 Welcome to the website of Cunningham’s Laundromat – Location 2 in Socha Plaza, Scotia, New York. Our second location is located up the road (about 20 mins away) at 9 Church Ave., at the intersection of Rt. 67 and Rt. 50 in Ballston Spa, NY. Our family owned business is new to the Scotia, Schenectady and Glenville area, but we have been providing quality and professional services to the areas of Ballston Spa, Burnt Hills and Saratoga and would like to do the same here. Why we’re better; for more than 60 years the Cunningham name has been a trusted source for many types of services. In the early days it was sales and service of farm equipment, located on Maple Ave. in Ballston Spa, as well as a car repair which started on Washington St. in Ballston Spa. By 1950 Cunningham’s was a full scale Chysler, Plymouth dearler, service and gas station, operating at its present location, 9 Church Ave., Ballston Spa. 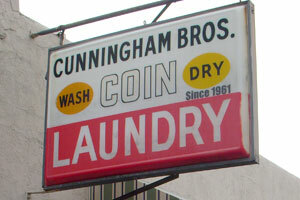 As years progressed, Cunningham’s weren’t only noted as the best in vehicle front alignment, but also as the first large scale self serve coin operated laundromat in Ballston Spa which opened in the spring of 1961. In 1975 a new chapter to the Cunningham’s list was added, and that was Ice manufacturing for whole sale and retail customers. Today the Cunningham’s name is the backbone for two laundromats, ice manufacture and sales, auto service and sales as well as commercial & residential rentals. From our family to yours, Thanks for choosing Cunningham’s!